He is really, really lovely. 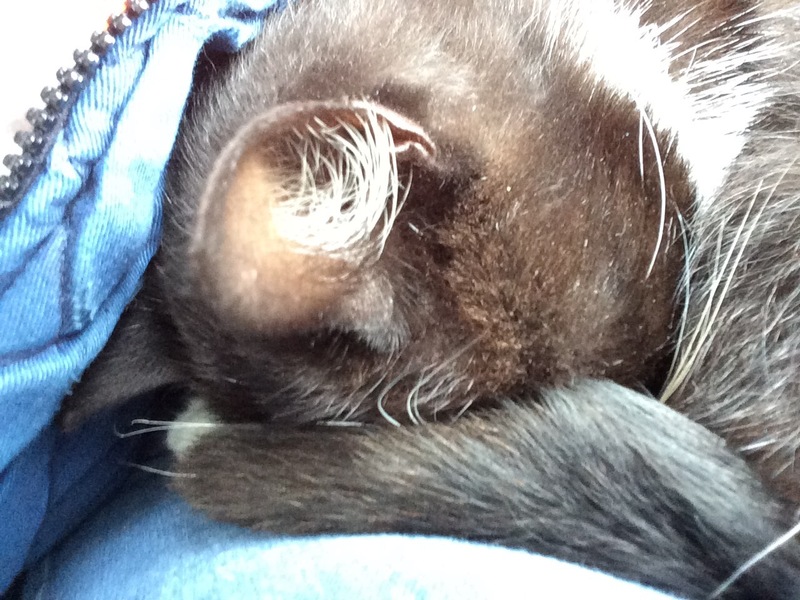 Unlike Peggy, he loves to curl up and stay on my lap. Unlike Peggy, he has no problem at all with being picked up and carried long distances. This was today. 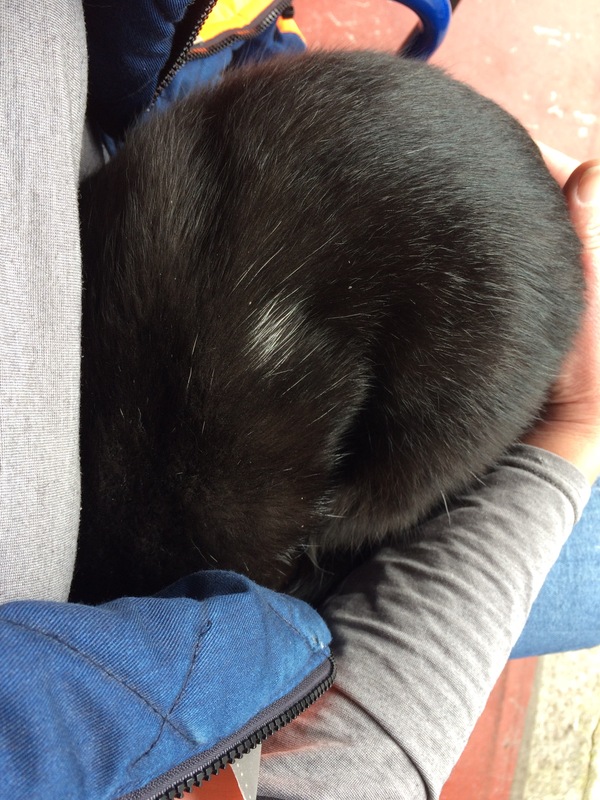 Once I stuffed him full of tuna and chicken, he hopped up on my lap, curled into a ball, tucked his head under my jacket and purred. He also has a weird, hitching breathing style that worries me. He also, unlike Peggy, is absolutely filthy dirty. I rubbed a damp paper towel over his back today, and pure black dirt came off of on the towel. He definitely does not have a clean place to sleep. 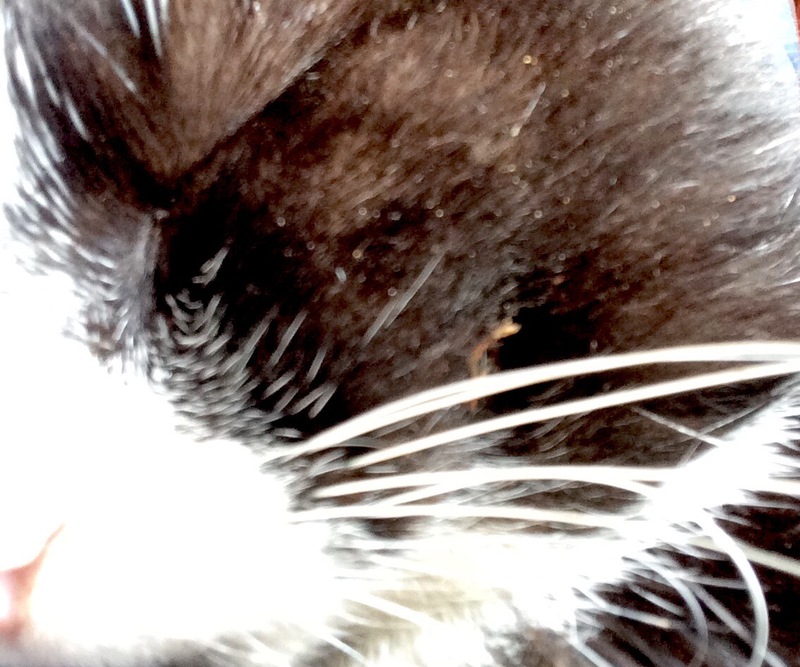 People might be feeding him, but no one thinks of him as their cat – the main reason I’ve not catnapped Peggy yet. Incredibly dirty and a bit bald around the ears. Also in centre of the frame is a small scab under his ear. He doesn’t mind me poking at this one. I know he is a much more desperate case than Peggy. Especially when I noticed he had some difficulty eating today’s chicken. I took the first chance to have a closer look, and yes, he has a swollen left cheek and what looks like an open abscess. I likely encouraged him to rip it open by scratching his head so much yesterday. I wasn’t about to grab his face and make him show me the wound, of course. 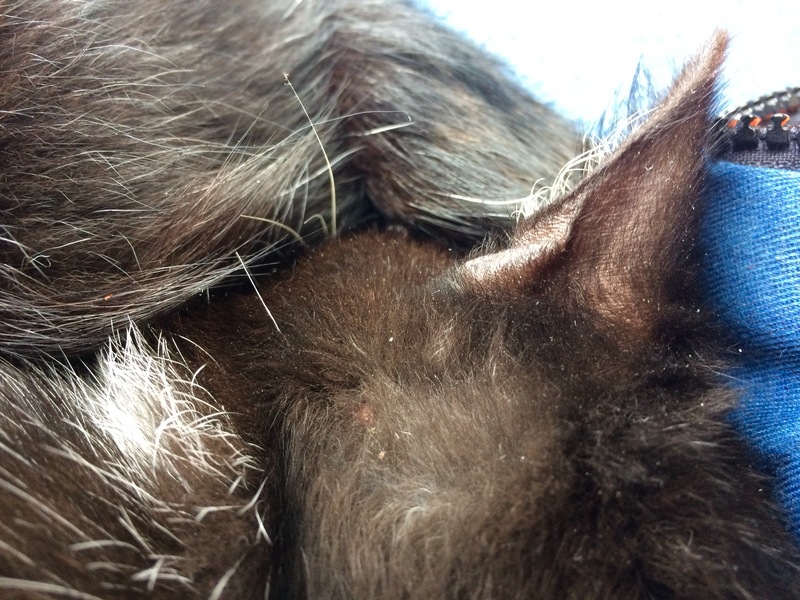 The dark spot is wet fur and the orange crust is likely pus. The plan tomorrow is to catch him and bring him home, but not inside the house. Maybe in our shed overnight, as small and junky as it is. In the morning, a run to the vet and leave him there with all the info I can give them. Fix the abscess. Worm him. Check on that odd breathing. Neuter him. All of this; if he doesn’t have a horrible, deadly disease that is going to kill him anyway. After that? I don’t know. I don’t know if I can take him home – hubby points out rightly that one indoor outdoor cat and two indoor only cats will cause havoc. I’ve also realised he is about 1/3 the size of Lumi – like having a housecat meet a Lynx he rightly could be terrified. Of course we have a big dog also, and he could be scared of dogs. And…he knows how to spray to mark territory, I saw him do it in a very inappropriate place. I think being in our house with two other male cats would likely make him pee on everything. He needs a warm safe place with cuddles and laps, access to the outside, and fewer cars as he has no damn sense around them. I don’t want to see him dead on the road and know I could have prevented it. I’ve never asked before, but if you want to donate to helping so-far-nameless kitty, you can send a donation via PayPal to my blog email address, heretherebespiders @ gmail . com (spaced it out so maybe the spam bots won’t find me, hahahah). Maybe Piggy can be next. Awww. Thank you for being so kind to this poor homeless cat! Oh, please. The vet trip and isolation until then. He needs a spot. If he’s neutered, he shouldn’t spray and he may be so needy he will try very hard to get along with all other animals. Even living in your shed would be an upgrade and life changer. I’ve taken in a desperate one before. Stall him off until one day I opened the door on a bitter day and he fell inside. His owners moved and left him to fend for himself. I really need to win the lottery. There are other, more personal issues, that are in the mix also. But I’ve not discarded the idea of keeping him. I can’t afford to get my hopes up. I’m thinking he will take to the inside right away. In which case, I think I have someone who will treat him wonderfully and I will be able to see pictures of him, too! Good luck! We had a stray turn up last year and demand to stay. Horrible wounds that he’d let us treat with iodine. Once they were clear, we did the same, took him to the vets and let them do their checks and balances. He’s now our only lap cat and doesn’t spray at all. The dogs get very jealous of all the love he gets but put up with him on the dog walks. I’ve found that if you take an outdoor cat into a new indoor space, there is almost no issue with wheedling to get out or pining for the outdoors. I’ve done it twice with big, swaggering males — look at Torvald! Also, fixing turns off the spraying like a tap way more often than not. Now if he has a window seat to the outside, Torvald’s happy as can be and never haunts the doorways. This little guy looks rough and is probably going to need medication like antibiotics. The only really awful hitch would be if he had something like FIV that wasn’t curable and could be passed to your guys. In any event, fixing and medicating sounds like the right thing to do. Thank you for helping! He is at the vet now – they stayed late and waited for me. Best option as he had been in a carrier for six hours by then! I’ll do a new post, it’s a funny/sad/stressful story. I’m glad you said that’s a cat. I thought for a minute you rescued a possum!! Looking forward to hearing the update – poor cat.